I'm going to try joining in with everyone over at Picture This. Here is my favorite picture from this week. We got our first "real" snow of the winter here in Madison, NJ. By real... I mean it actually caused a school snow day. The first one this school year. (I'm in no way complaining!) 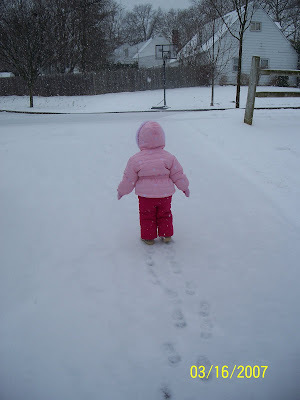 Zoe just enjoyed walking around in her snow pants. She insisted on wearing them outside for the last few days. We've been out more in this snow than we were in the sunny days we had before the storm. Looks like I'm doomed to have a snow bunny girl!